Watching our parents age, lose their clarity and ability to manage day to day activities can be heart wrenching, not to mention frightening, even for adult children. Sometimes, it’s just easier to think that the behavior we are seeing is a one-time occurrence – the forgetfulness, the poor decision-making. But the truth is, cognitive decline is more likely to occur as a person ages. By the age of 85, there is a 50% chance that an individual will develop dementia. Maintaining independence is very important to all of us. Driving a car, staying in our home and managing our own finances are responsibilities that we cling to. When dementia is escalating, the costs can be devastating to a senior’s future. So what happens when you are forced to step in? Many clients come to us in just this situation. A loved one presents with health rapidly declining and an inability to manage their day to day money decisions. 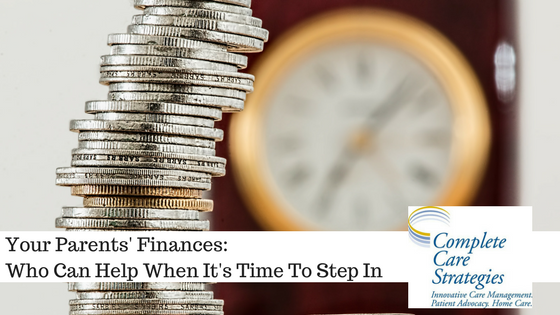 Family caregivers, adult children are sometimes ill-equipped and frankly, overwhelmed at the complexities of how to transition financial decision-making as their parent continues to age. In an ideal situation, your family has already come together and put a succession plan in place when it comes to family finances, investments and assets. Financial power of attorney has been determined, family members are clear on who will contribute and fill each need. Family members are in touch with care managers, elder law attorneys, financial planners who know your parents and can help bring their financial picture into clear view. However, this is seldom the case…and we’re left to play catch up when a crisis arises. There are a variety of professional resources that can help you navigate this unchartered territory. They are elder care experts, be it finance, law or health care. Time is precious in this situation and you need decisive, educated, practical and unbiased advice to help steer the ship. A reputable senior care agency should be your first call. Aging Life Care/Geriatric Care managers frequently refer to and coordinate with other elder care professionals, including elder law attorneys and financial advisers. Financial services for the elderly is a big part of what we do on a day to day basis and especially when working with new client. We’ll work with families to identify applicable benefits, including Medicaid, Medicare, long term care and supplemental insurance, veteran’s benefits and more. Beyond that, care managers will coordinate with insurance providers to make certain that clients receive maximum benefits to assist in their retirement and long term care plan. Care managers will communicate directly with trust officers, clients and family members so that everyone is on the same page. Don’t make the mistake of trying to navigate elder laws on your own. Elder law is bound by state law and so it can vary by state. This can come into play when you are determining medical and financial powers of attorney, directives set forth in a will, advanced directive or trust. Elder law attorneys are well versed on the ins and outs of Medicare, Medicaid, long term care insurance and other elder care programs that other legal professionals may not be. Bottom line, don’t cut corners here. Not all attorneys are elder care attorneys. A trusted financial planner can be critical in managing the finances, assets and investments of your loved one. They will advise your family on how best to protect and preserve what you have and find additional funds you might have thought of. Financial planners will look at your existing financial situation, with your stated goals in mind, and offer their best recommendation on how to get there. Our recommendation is always to start this process early! It’s best practice to put your long term care plan in place while you are healthy and able, before faced with a crisis. The longer you wait to put these pieces in place, the less options you’ll have at your disposal.